You can modify a Skytap environment by adding copies of VMs from the current environment or adding copies of VMs from other environments or templates. This helps you mix, match, and reuse VMs. For example, if you have a Jenkins server configured in a template, you can quickly add copies of the VM to each of your dev/test environments. 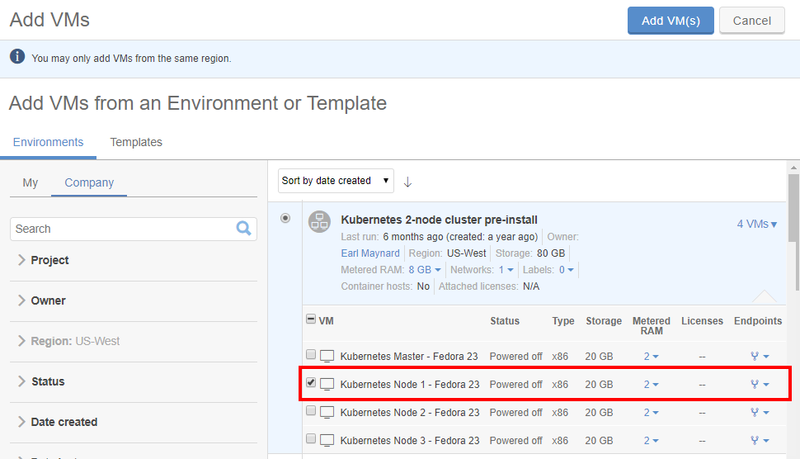 Select one or more VMs in an environment or template. When you add an environment or a template with multiple VMs, you can choose to add all of the VMs or just some of them. Only one environment or template can be selected at a time. If you need to add VMs from multiple environments or templates, repeat the Add VMs process and select a different environment or template each time. Skytap Cloud adds the VM(s) and network settings as described in Automatic configuration steps that happen when you add VMs to an environment below. If you add VMs from the current environment, you may need to perform some additional configuration steps to ensure the VM has unique identifiers. For example, you may need to edit the VM MAC address or edit the Windows hostname. The table below explains what happens when these network parameters do or do not match. The networks are merged. The network in the current environment is preserved and the new VM is automatically connected to it. Skytap adds a copy of the network to the environment. The new VM is attached to the new network created during the copy process. Skytap generates a merge error and does not allow you to add the VM to the environment. (Automatic) Merge error: The networks could not be merged because their subnets overlap. Error: The networks could not be merged because their subnets overlap. Error: The networks could not be merged because they are of different types. Error: The networks could not be merged because their domain names differ. Edit the VM to disconnect its network adapter from the conflicting network and then retry the Add VMs operation. Edit the network attached to the VM or the network in the current environment. Make sure the network subnets do not overlap, or make sure the networks match entirely. For instructions, see Editing an automatic network. After the network is edited, retry the Add VMs operation. A MAC address conflict occurs if Skytap Cloud cannot give the VM a unique MAC address on the network. Generally, this errors appears when a suspended VM is copied to the same environment. The VM is added to the environment, but isn’t connected to the network. Shut down the VM. If the VM is suspended, we recommend that you run it and then safely shut it down. Edit the VM network adapter to give it a unique MAC address. Edit the VM network adapter to connect it to a network in the environment.